Windows XP is dead. Oct 31, 2014 was the last day that PC manufacturers could sell a new PC loaded with Windows 7 Home (You can still purchase PCs loaded with Windows 7 Professional). Some people who have transitioned to Windows 8 have continued to struggle with the traditional desktop environment vs. the modern touch-friendly environment optimized for mobile devices. Some have been waiting for Windows 9, hoping that it would resemble Windows 7. Well, Microsoft recently announced that they will be jumping right from Windows 8 to 10. There will be no Windows 9. 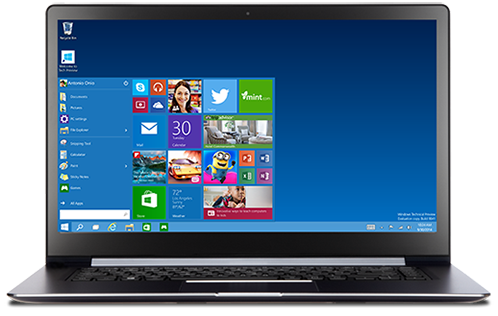 Microsoft has allowed developers and IT professionals to test the prerelease version of Windows 10 through the Windows 10 Technical Preview program. We're expecting Microsoft to release Windows 10 in 2015. Do you remember when Microsoft released Windows 8? It was Oct 2012. In many ways, Windows 10 will feel similar to Windows 8, but the Start Button on the lower left corner will return some features that some of us missed from Windows 7. Windows 10 will also include more robust enterprise security features and provide enhanced enterprise management options to simplify life IT departments. The reality of BYOD (bring your own device) will be easier to manage on devices running Windows 10 since your data will be separated into work vs. personal. To me, the biggest change in Windows 10 is that it will run across all devices: smartphones, tablets, laptops, and desktops. That's right - smartphones! Can you imagine running some of your enterprise applications on a smartphone screen? I've joined the Windows 10 Technical Preview program, so I'll be sharing some of my thoughts as I take Windows 10 for a test drive over the next few months.